What Happened to the Garden? For those who have been following my blog for a while (or have browsed through my older posts here and on Tumblr), you may be wondering what happened to our garden since I was laid up for so long. Between the miscarriage just before E, my long pregnancy bed rest, and my difficult postpartum recovery from my symphysis pubis dysfunction, our garden has been very neglected for about a year now. My husband had the overwhelming burden of taking care of literally EVERYTHING while I was laid up. In addition to his long hours at work, he had to be responsible for all of our shopping, errands, laundry, cleaning, cooking, and caring for me. Considering I could not even bathe myself for much of that time, the load on his shoulders was quite heavy. Somewhere in the midst of all that, he also found the time to finish our kitchen remodel, remodel the baby’s room, and deal with all the stress of getting that house in Texas sold. Worrying about our yard was not high on his list of priorities. 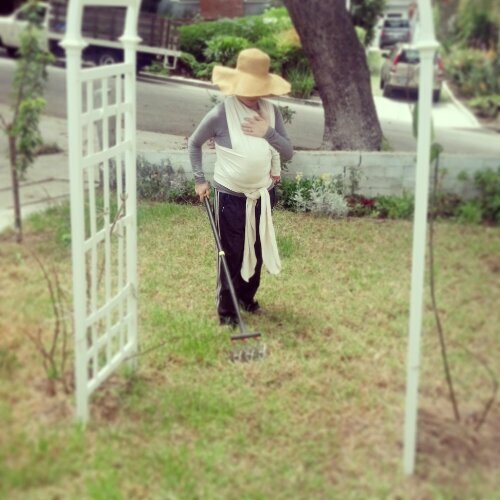 At one point, my husband brought up the idea of hiring a gardener to take care of things while I was laid up, but I hate that idea. It may seem weird, but I can’t stand anyone else messing with my plants. We tried that when I was in bed with pneumonia for over a month (about two years ago), and they pulled out most of my herb garden, claiming they thought it was all weeds. It is bad enough that someone dug up and stole a bunch of my plants here while I was in the hospital after E was born. I would have been pretty mad if even more had been dug up or mistreated. Surprisingly, our front yard held up relatively well considering the total neglect. It was looking very embarrassing for quite some time, but I am glad that the majority of my plants survived. Buying drought tolerant and native plants really paid off! This past weekend, we spent as much time as possible getting everything more in order both in the front and back yards. We pruned dead growth, trimmed and shaped plants, pulled out tons of weeds, cleaned up lots of pine needles, relocated plants that were running out of space, dug out plants that did not survive, fertilized everything, worked in compost, and added new wildflower and grass seeds. It was a lot of work but so worth it. These pictures were taken at the end of our cleanup. They will be a good reference point to see how quickly everything starts to perk up! Lately we have been trying to stick by our weekend rule of one day of projects for the house and one day of something fun. E will only be little for so long, and we don’t want to look back and realize we didn’t enjoy this time because we worked too hard on our house. We made an exception to that rule this weekend since we were all enjoying bring outside. E even joined in a little in the Moby wrap (Instagram pic at the end). This entry was posted in Gardening and tagged compost, diy, drought tolerant plants, fertilizer, flower garden, flowers, fruit trees, garden, gardener, gardening, grapes, grapevines, grass, home, homestead, homesteading, lawn, native flowers, native plants, organic, planting, plants. Bookmark the permalink.